Weekend Historical Happenings: 6/22/13 - 6/23/13 ~ The History Girl! Know about a historical event happening in your area? Send me an e-mail to let us know! Be the first to find out about these events on Facebook! On Saturday, Bergen County will hold its annual Juneteenth Celebration from 10:00 am - 7:00 pm. The theme of this year's Juneteenth celebration is "At the Crossroads of Freedom & Equality: The Emancipation Proclamation and the March on Washington". The event will be held rain or shine at the New Overpeck Park in Ridgefield Park (entrance is off of Fort Lee Road in Teaneck/Leonia). The day will include entertainment, food, games, cultural and historical displays, vendors, music and tours of Historical Gethsemane Cemetery. Why Preserve the Ford Mansion? Come browse among the many dealers at the Antiques and Fine Crafts Fair on Saturday in West Cape May (Wilbraham Park, Broadway and West Perry Streets) from 9:00 am - 5:00 pm. Sponsored by the Greater Cape May Historical Society. Proceeds benefit the Colonial House Restoration Fund. For more information call Joan at 609-898-1236 or visit www.capemayhistory.org. Free parking. Rain date Sunday, June 23. The Proprietary House Association is pleased to announce its annual reenactment of the arrest of Royal Governor William Franklin at The Proprietary House Saturday at 2:00 pm with a new script and a new cast! Kevin S. D. Connelly brings many years of acting experience to the role of William Franklin, having appeared on stages in New York City and New Jersey. General Nathanial Heard, who led a detachment of militia troops from Woodbridge to arrest the Govenor, will be portrayed by Ed McGuinn. William Franklin's wife, Elizabeth, will be played by Kimberly Reddan, and their son, William Temple Franklin, by Kevin Connelly, Jr. Also appearing will be Jakob Trinidad as John Lazenby, Steven Allegretta as Private Preston, and Tony Sattilaro as Josiah Aubrey. The new script is by Association First V. P. Greg Caggiano. There are some elements remaining, such as parts of the narration, from the original, decades-old script used by the association, author unknown. In late 2011, Caggiano and actors at the time, Gene Hoyas and Kurt Epps, began to tweak the script by adding some new characters and dialogue. In January of 1776, New Jersey's Provincial Congress ordered William Franklin to be held under house arrest at his Perth Amboy mansion. He was ordered not to conduct any government business, but defiantly called for the assembly to convene as usual that spring. On June 19, 1776, a militia unit under the command of General Nathaniel Heard of neighboring Woodbridge arrived to place the Governor under arrest. He was sent to prison in Connecticut, never to see his wife Elizabeth or their home in Perth Amboy again. Elizabeth Franklin remained at the house until the British briefly occupied Perth Amboy in 1777, allowing her to flee to British-held New York where she died. William Franklin was released in a prisoner exchange 1778 and remained a leader in the loyalist communities of New York and Nova Scotia before being exiled to England 1782. He died there in 1814. The arrest of Franklin marked the end of Great Britain's claim on New Jersey as an English colony. But it is also a poignant reminder of how the difficult choices people were forced to make had very real personal costs. The reenactment of Franklin's arrest is the highlight of The Proprietary House Museum's events, providing a reminder of the rich history at the House and Perth Amboy. The Proprietary House Museum is located at 149 Kearny Avenue, Perth Amboy, NJ. For more information, visit www.theproprietaryhouse.org. On Saturday and Sunday, the Roebling Museum opens their latest exhibit, "Steadfast Under Fire." This exhibit explores the role of Washington A. Roebling and other engineers during the Civil War and Gettysburg. The museum and grounds will be open Saturday and Sunday from 11:00 am - 4:00 pm. A living history encampment of Civil War reenactors on the museum's lawn will showcase a soldier's life on the battlefield - featuring a historic hydrogen balloon, Civil War period craftsman, military demonstrations, children's crafts, and more! The grounds will be free and open to the public! Regular museum admission applies to view the exhibit. $6.00 Adults; $5.00 Seniors and children ages 6-12; Free for museum members and children under 6. The Roebling Museum is located at 100 Second Avenue, Roebling, NJ. For more information, call 609-499-7200 or visit www.roeblingmuseum.org. Interested in ghost hunting? Like learning about the supernatural and spooky? Visit Historic Cold Spring Village for its ‘Paranormal Pursuits’: Spiritualism in the 1800s weekend event to be held on Saturday and Sunday from 10:00 am - 4:30 pm. In addition to experiencing the Village’s 26 restored, historic buildings dating from 1691-1912, guests can enjoy various workshops, demonstrations and tours which highlight the study of spiritualism and the paranormal. 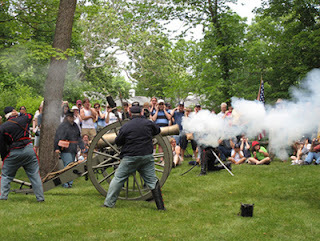 The Virginia Infantry Ghost Hunters (www.tvigh.org) will share the results of their research at Gettysburg and various other battlefields throughout the Mid-Atlantic. Based in New Jersey, the group uses video and sound equipment to identify the presence of spiritual activity, in the form of orbs and electronic voice phenomena, and will present their evidence to HCSV visitors. Local paranormal investigation group, Truth Paranormal Investigators of South Jersey, will also share the findings of their recent investigation at the Village and demonstrate their ghost hunting equipment in the Welcome Center throughout the weekend. Guests can also explore the Village’s own paranormal past and present during a ghost walk led by longtime Village staff member, Shirley Stefanovicz, at 11:00 am, 12:30 pm and 2:00 pm on both Saturday and Sunday. At various buildings throughout the Village, Stefanovicz will detail the supernatural experiences had by Village staff members as well as the evidence of ghostly presences discovered by visiting mediums and psychics. Author Gregory Young will offer a reading from his book, A Father, A Son and A House Full of Ghosts, a true story of what it was like living in a real haunting, at 11:30 am and 3:00 pm on both Saturday and Sunday. In addition, visitors can experience the spirit photography of Greg Geraci, have their cards and palms read, try their hands at divining rods, and learn about phrenology and the rise of spiritualism in the 19th century. Historic Cold Spring Village is a non-profit, open-air living history museum that portrays the daily life of a rural South Jersey community of the Early American period. It features 26 restored historic structures on a 30-acre site. From late June to early September, interpreters and artisans in period clothing preserve the trades, crafts and heritage of "the age of homespun." Fun and educational activities for children are featured Tuesday through Sunday, with special events every weekend through mid-September. Enjoy delicious Jersey fresh clams, crabs, scallops and shrimp from the finest local seafood purveyors at the Tuckerton Seaport on Saturday and Sunday from 11:00 am - 5:00 pm each day! Crafters, vendors, music, food, beer garden, family activities, demonstrations, boat rides, boat builders and decoy carvers. Speak with commercial fishermen to learn about occupations on the bay or take a clam shucking class. Entertainment by local favorites Motts Creek Pickers and the Billy Walton Band! Listed as one of the best outdoor festival by NJ Monthly Magazine. Presented by the Jersey Shore Folklife Center. General admission: adults $8, seniors $6, ages 5-12 $5, under five free and Seaport members free. Tuckerton Seaport & Baymen's Museum is located at 120 West Main Street, Tuckerton, NJ. For more information, call 609-296-8868; or visit www.tuckertonseaport.org. On Sunday from 12:00 noon - 5:00 pm, the Red Mill Museum Village will host its first ever Antique Engine Jamboree. Featuring antique engines, caterpillars, tractors, trucks and more, visitors will have the opportunity to view early farming machinery, engines and equipment demonstrations. There will be a range of engines from early to mid 1900s Fords and Chevys to Farmall and John Deere tractors. There will also be activities for families including antique toy tractor pulls. Read any good houses lately? What?! You've never read an old house or barn before? Well, here's your chance to learn how at the Dvoor Farmstead in Flemington, NJ. Jeffrey Marshall, president of the Heritage Conservancy, will present three talks during the Hunterdon Land Trust's Farmers' Market the fourth Sundays of June, July and August teaching how to research and read historic homes and barns. The first talk on Sunday, is entitled "Why Old Buildings are Important and How to Research Them." Gaetano Federici left his native Castlegrande, Italy as a young boy in the late 19th century and settled in Paterson, where his talent as a sculptor had made him so well known that his name is almost synonymous with that of the Silk City. His works have graced building facades, public spaces, and private collections far and wide. His subjects include a wide array of public figures, from Christopher Columbus, to Alexander Hamilton, to Lou Costello. The Passaic County Historical Society is proud to present a screening of Vincent Parrillo's PBS documentary entitled Gaetano Federici: The Sculptor Laureate of Paterson at Paterson's Lambert Castle on Sunday at 7:00 pm. The documentary was filmed partly at Lambert Castle and features works by Federici from the historical society's collections. The society is currently engaged in a project to restore and exhibit the Federici sculptures. More information on this project can be found at www.lambertcastle.org/federici.html. For more information about the screening, call 973-247-0085 or visit www.lambertcastle.org. Celebrate the wedding of James Allaire's daughter, Maria, with the Villagers at the Historic Village at Allaire! In a historic reenactment of the event, visitors are invited to the ceremony in the beautiful Allaire Chapel, where Maria and Thomas will be married at 1:00 pm on Sunday. Following the ceremony, visitors may join the happy couple in the Village where a wedding reception with wedding cake will be held! Visitors (especially kids!) are invited to join the Villagers in dancing, listening to historic music, eating cake, and celebrating the happy day. The Village is open from 11:00 am - 4:00 pm. Admission to the event is free but there is a $5.00 per car parking fee. Did you ever wonder what all that “stuff” is placed around the grounds at Ringwood Manor? What about all those other buildings on the property? What were they used for? If you have ever been curious about the estate at Ringwood Manor, this tour is for you! The 2-1/2 hour guided walking tour will take visitors around the main property at Ringwood Manor, discussing the historic objects, the planned gardens & landscape features, the out-buildings, and the cemetery. Historic photographs of the property will also be shown. These free tours meet at 11:00 am, 1:00 pm, and 2:00 pm in front of Ringwood Manor every Saturday and Sunday from May 25 - October 27, 2013. It is advised that participants wear walking or hiking shoes, dress appropriately for the weather, and bring bug spray and sun block. Steady Rain cancels. No reservations necessary. For more information and to call ahead to confirm a tour, call 973-962-2240. Ringwood Manor is located at 1304 Sloatsburg Road, Ringwood, NJ, within Ringwood State Park. View the exhibit "Got Work? New Deal/WPA in New Jersey" at the 1741 Cornelius Low House Museum in Piscataway. The museum is open Tuesday - Friday, 8:30 - 4:00 pm and Sunday afternoons from 1:00 - 4:00 pm. The exhibit will run through June 30, 2014. Lambert Castle, the Victorian-era mansion located on the Garrett Mountain Reservation on the border between Paterson and Clifton, will be home to an exhibit highlighting the Paterson Silk Strike of 1913 now through October 6, 2013. The exhibit, entitled "We Had to be Rebels: Remembering the Paterson Silk Strike of 1913." This year marks the centennial of the landmark 1913 Paterson Silk Strike, which would forever change the face of labor relations in the Silk City. Thousands of workers walked away from their looms to be herded into court rooms and jail cells in a strike that took months to resolve. The exhibit will be open during regular museum hours: Wednesday through Sunday, 1:00 to 4:00 pm. Lambert Castle is located at 3 Valley Road, Paterson. For more information, call 973-247-0085 or visit www.lambertcastle.org.